Seeing is Believing This sample manual to teach Creative Thinking and Innovation is in MS Word format. Are you looking for a training package to teach creative thinking and innovation? Look no further! This two-day program contains everything that you will need to teach a successful creative-thinking course. We've designed an in-depth program that covers the creative thinking problem-solving model, ways to boost individual creativity, team creativity techniques, and individual innovation methods. We've also included plenty of activities so that students will get hands-on practice with creative thinking. 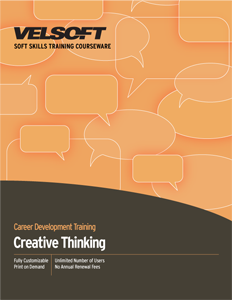 This creative thinking and innovation package comes with an instructor's guide, student manual, quick reference guide, PowerPoint slides, and more. You can train with it right away, or customize it for your organization and your participants. It's up to you! This course is also offered as eLearning so that you can create a blended-learning experience.